Oh, yes, bad adaptations. That's the subject of this week's game, you see. You will be provided with a list of ten actors' names-- your job is to match each one with a) the P&P adaptation they appeared in (i.e. 1940, 1980 or 2005) and b) the character they played. No fair checking IMDb! You must make your best guess... and you only get one shot at it, so think very carefully before submitting your answers in a comment. You will get one point for each correctly guessed character and one point for each correctly guessed adaptation. You may also acquire five extra bonus points for answering the bonus question, for a total of 25 points maximum. Have fun! BONUS: What connexion does the humanist satirist Aldous Huxley have with Pride and Prejudice? 3. Melville Cooper - P+P 1940 as Mr. Collins? 6. David Rintoul - P+P 1980 as THE CREEPIEST DARCY EVER. Ugh!!! 8. Sabina Franklyn - P+P 1980 as Jane? 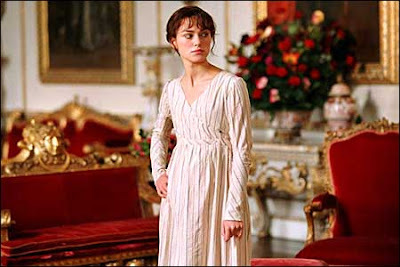 or Caroline Bingley? Arg! not sure! 2. Maureen O'Sullivan = 1940, Jane? 5. Brenda Blethyn = 1980, Lizzy? BONUS: Wouldn't have a clue but you've piqued my curiosity! Did they approach him to be Mr. Bennet? 1. Judi Dench - Lady Catherine in the FakeP&P. 2. Maureen O'Sullivan - Was she Jane Bennet in the black and white P&P?!? 3. Melville Cooper - Wild guess here ... Mr. Gardener in the 1980 P&P? 4. Osmund Bullock - NO idea! 6. David Rintoul - Have no idea! 7. Laurence Olivier - Mr. Darcy in the black and white version. 9. Sabina Franklyn - Mary Bennet in the black and white P&P? BONUS: Ain't NOBODY got time for that!! 2) 1940, either Jane Bennet or Caroline Bingley. I think I can get a few...perhaps. If it was the reverse guessing I would be completely lost. 4. Osmund Bullock - what a name, poor man! Mr. Bingley 1980? 2. 1940. Um... one of the Bennet girls, I think... :P Jane? 3. Ha... uh... random guess and I'll say 1980. 5. Is this Mrs. Bennet from 2005? 9. Philippa--er, I mean, Jane Bennet, 1980. Bonus: Aldous Huxley was one of the screenwriters of the 1940 version of P&P. Thanks for your comments and answers, everyone! This contest is now closed.